Quick turn-around of smaller quantities, as well as larger volume competitive pricing. Our offshore advantages include the lowest labor costs in the Western hemisphere, making our pricing competitive with suppliers anywhere! 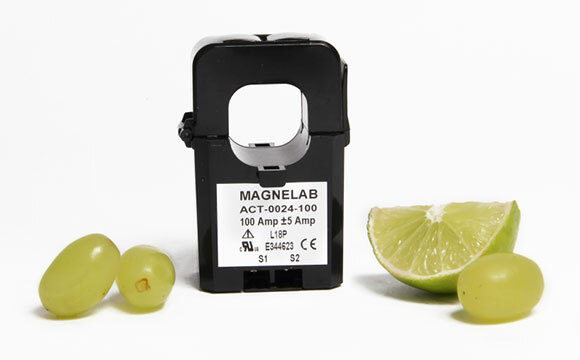 The Magnelab ACT-0024 AC current sensor, previously sold as the MAG-J24C005. A split-core AC current sensor and a 24mm opening that transforms AC current input ranging from 100 to 300 Amp to a 5 Amp output. AC current sensor – used on electrical wiring that has already been installed, simply snap it around a conductor. The Magnelab ACT-0024 also comes with a self-locking mechanism. This is a class 2 current transformer used in a number of different applications, including as a power meter or as switch gear. Additionally used for distributed measurement systems or for general sets or control panels. A similar product, but with different specifications, the ACT-0036 AC Split-Core Current Sensor has a 36mm opening. Current input ranges between 200 to 600 Amps and the output is 5 Amp. Both have an accuracy of 5% to 120% of rated current for frequencies 50 and 60 Hz. Their accuracy is Class 3 for up to 1.5VA for ACT-0024 and up to 2.5VA for ACT-0036. They come with two M3 screw terminals and are compliant with RoHS and CE, as well as being UL recognized. The system voltage is 720 V, with Category II or Category III at 600 V AC. Protection level is 6.5Vp bipolar. All Magnelab current sensors also come with significant warranties. This is a testament to the quality of manufacturing. Length of warranty depends on the sensor.